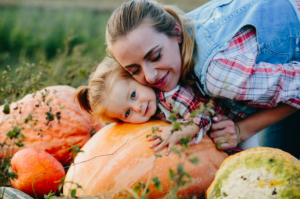 We have rounded up a few fun and festive activity ideas that will get everyone into the “thankful” holiday spirit! Turkey Play Dough. Set out some craft supplies and brown play dough so kids can create their own turkeys. Learn more about this activity here. Thankful Turkey Pine Cones. Have your kids think about what they are thankful for and write it out onto colorful strips of paper and glue them to pine cones. The pine cones can be attached together and used to make a fun and “thankful” centerpiece! Turkey Coloring. Print out these free fall coloring pages and have your little ones get into the spirit of the holiday through colors! Festive Food. Make a delightfully festive turkey tray with your kids out of cheese, salami and pretzel crackers. Read all about this yummy treat here.